Arq can back up to any folder you want, so you could configure it to back up to a folder that lives on your NAS, but there’s a better way: use Minio! Minio is an open-source S3-compatible storage server. If you install Minio on your NAS (Synology supports Minio via Docker on many of its NAS devices), Arq can back up to your NAS using Minio and get benefits over SFTP like atomic writes of files (faster and less error checking required by Arq), checksums of uploaded data (so Arq can verify the NAS received the correct data), and much faster validation of data (comparing checksums instead of downloading data to compare). In the Docker window, click on Registry. Then search for minio. Click on minio/minio in the search results and click Download. Choose the tag “latest”. (Make up whatever values you want for access key and secret key). Pick Preferences from Arq’s menu to open Arq’s preferences window. Click the + button to add your destination. Choose “Other S3-Compatible Service” and click Continue. Enter the URL for your minio server in the form of http://synologynasname:9000. Enter the access key ID and secret access key you provided to the “docker run” command previously. Choose Signature Version 4. Click Continue. Click Continue to create your bucket on your minio server. 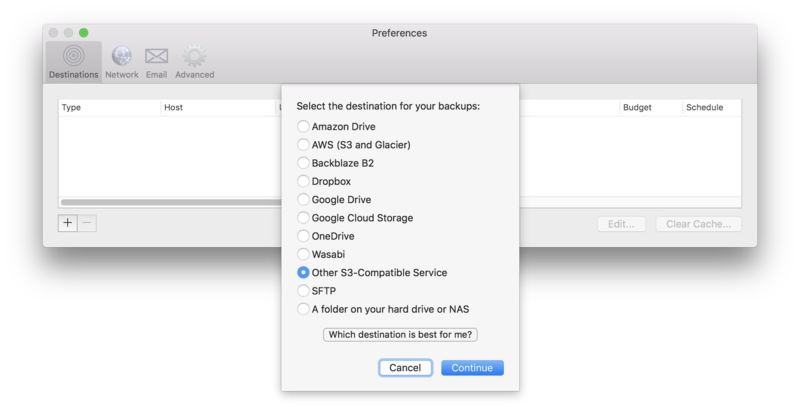 Pick “Add Folder to Backups” from Arq’s menu to add the folder(s) you want backed up. When you add the first one, Arq will ask you to choose an encryption password. Please write it down somewhere! Without it you won’t be able to decrypt your backups if your computer is lost. That’s it! Arq will back up whatever folder(s) you selected, every hour. As always, if you have questions please email us as support@arqbackup.com.